From where to get new ideas for content? How is React Native the next thing for Hybrid apps? In the current active scenario of social media platforms, businesses definitely don’t have a choice on whether to do social media or not but the question that arises is how well they are able to do it. The peppy social media platforms are a great way to build a following of your brand effectively. While already a number of brands are active on these channels, the competition has increased and the attention span of users of have decreased. Each day users open these sites and scroll through long pages of content, leaving a very small window for businesses to grab their attention and hold them. But here are some trends that we believe will make your social media marketing strategy a big hit in the year 2018. Content personalisation: Personalisation is the prerequisite of content than whether this content is for social media, websites or anywhere. 85% of people don’t like the traditional way of content which is solely written to sell the product. 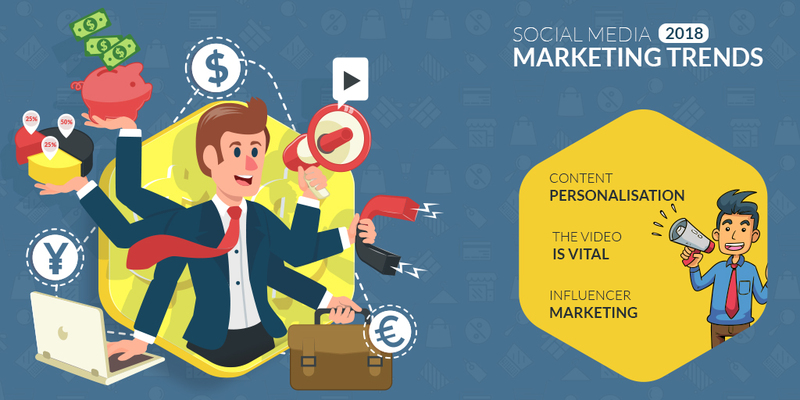 People like the content which relevant to their needs or interests, therefore content which is based on user personas is more likely to be read and shared. These persons can be users age, location, income, education level, likes, dislikes, gender and etc. Businesses should always study their user’s persona and then prepare content based on it in order to hit them rightly. Remember, a different content which can engage the user on a personal level will always hold them until the end. The video is vital: Videos are getting popular day by day. In 2017, 90% of content shared by users on social media is video. Facebook, Instagram, Snapchat and Twitter, all are investing in videos to generate more sales and build followers. Videos on Facebook received higher engagement, better comments and more likes than written content. Soon video will be the only type of content we all will consume. Viewers remember only 10% of the message when they read it in text and retain 95% when they see it in a video. Thereby, businesses should invest in videos now, study what exactly their users like and use different tools like Facebook Live or Instagram Live to create exciting and engaging videos for the users. Influencer marketing: This form of marketing has been quite popular on social platforms in the year 2017. Influencers are the people who are connected with your users and lead to direct sales, owing to their recommendations. Often people look to their networks on social platforms for advice on the buying decision or have bought something out of the promotion done by influencer on Instagram or Twitter. Surely, the marketing will work in 2018 also but then be careful in selecting the right influencer for your users. Focus on building meaningful relations with them in order to get the proper noise of your brand from them. In the end, we know we have just presented three trends for social media marketing in 2018 but trust us they are actionable for businesses of all sizes. Social media is a very dynamic and volatile platform and therefore businesses must keep themselves abreast of all the trends and opportunities coming up here in order to stay prepared and ahead of competitors to take the advantage.